» ᴛʜᴇ ᴏᴀꜱɪꜱ ꜱʜᴏᴘ | ᴏʀᴅᴇʀꜱ ᴏᴘᴇɴ! | ʜɪʀɪɴɢ! ᴛʜᴇ ᴏᴀꜱɪꜱ ꜱʜᴏᴘ | ᴏʀᴅᴇʀꜱ ᴏᴘᴇɴ! | ʜɪʀɪɴɢ! Credit to Lilianna81 for that fancy text I've used at the top of most posts. Oh don't worry about the door, I have door insurance. Look below for the order forms! If you have any questions, ask me on my profile! Awarded to projects that have an intresting concept. Awarded to projects that are subjectively cool. Awarded to projects that look pretty. Awarded to projects that last a decent amount of time. 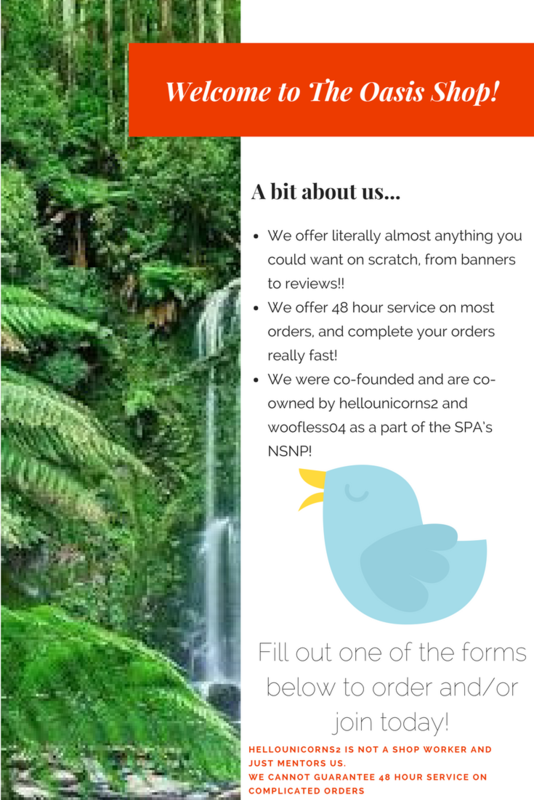 11.3.18 - Joined the NSNP. 21.3.18 - First Project added to leaderboard. 24.3.18 - First post on second page. 25.3.18 - First time having a order put on hold. 27.3.18 - First review of shop. 8.4.18  - Woofless accidentally closed the shop. 26.4.18 - 10th page was created. Woofless04, Activity - 5 Can't draw people. CoderGirly, Activity - 5 Can't do anything other than vector. doodthedoodthedood, Actvity - 9 Can't do art, mainly does reviews. TheRedwoodForest, Activity - Depends on circumstance Programming, mainly does vector and humans. TK421bsod, Activity - 9 Anything involving art. Lion1278, Activity - 9 Not great at drawing humans, but she can. This means you are very active. This means you are active enough. This means you haven't been active. This means you are away and are permitted to be inactive. *Note* I removed somethings because I don't agree with them, e.g. firing. Description - I'd like a picture of a wooden toolbox with some tools (such as a spanner, hammer, spirit-level etc.) sticking out. 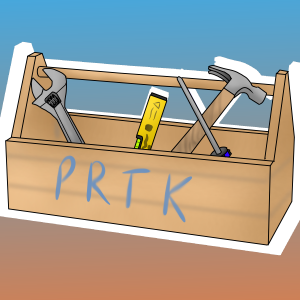 The wood should have “PRTK” printed on it. Cool! I'll try and complete it by tonight. Cubeupload seems to be back up so I'll upload it there. Got it! It should be done soon. I really like the colours! They're really vibrant and match the “Easter” theme, which from what I can see is what you are going for. The shop mechanic is pretty cool, it allows players to do something with the amount of times they click the egg, the things you can buy in the shop also prevent the game from becoming too monotonous. You know how I said “too monotonous” an entire sentence ago? Yeah… The game does get kinda boring and tedious after a while, and whilst this could be chalked up to a general problem with clicker games, it's still an issue in this game. The music also gets kinda grating after a while. Perhaps change the music to something calmer? The music at the current moment doesn't really suit the atmosphere too well (being that of a sunny hillside), may I suggest something from Animal Crossing? To fix the monotony, how about the amount of eggs per click goes up by 1 every 100 clicks? You don't have to of course. Music - 10/10 Issue fixed, original score 6. Don't worry fren! I didn't rate your game badly because it was particularly terrible, I think everyone has room to improve! And from what I can see you're relatively new to Scratch! I've been on for roughly 2 years now (I had an old account) and I'd still probably rate my stuff a 25/35, I'm looking forward to see what you can do in the future! P.S. I mentioned it in the studio, like you asked. The shop mechanic is pretty cool, it allows players to do something with the amount of times they click the egg, the things you can buy int the shop also prevent the game from becoming too monotonous. Yep! The music suits it much better now, I'll change your review score.